A couple of weeks ago, Christian and I agreed to try and get a game of BKCII in using his Americans against my Italians. After a bit of research, we settled on part of 'Operation Husky', the Allied invasion of Sicily. With the successful breakout from the Gela bridgehead, Axis forces are performing fighting withdrawls to the Hauptkampflinie, the first line fo defence intended to slow down and then stop the Allied advance. 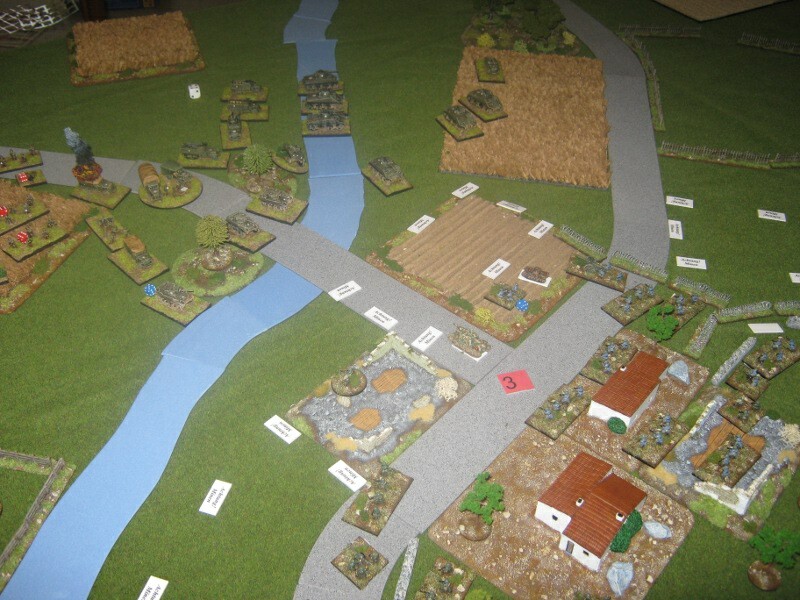 Elements of the 28th Infantry Division Aosta and Battlegroup 'A' have reached the small village of San Serotonin and have taken up defensive positions as part of the Hauptkampflinie. Logistic problems on the part of the American II Corps have prevented them from pursuing the retreating Axis forces as they would have liked. So with a build of men and materiel, they have planned a large scale attack to try and break through at San Serotonin so that they can outflank the defenders positions and push on. Major objective: Take control of San Serotonin. Minor objective: Cut off escape route for Axis forces. The Defender may only take Hasty Defence options but may use the points available for Fixed defence, ie up to 500 pts on Hasty Defence rather than 200 pts. 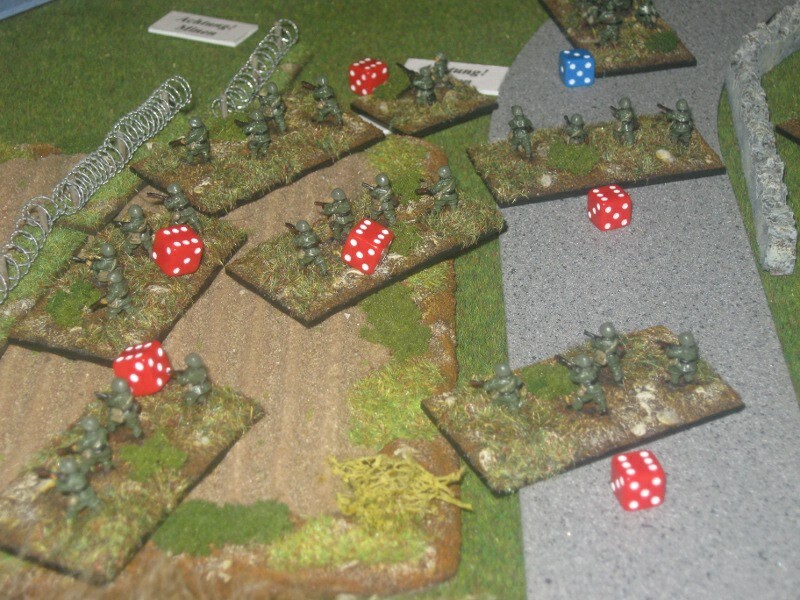 This is to reflect the speed of the Allied advance and the lack of time to construct pill boxes, dragons teeth etc. No Naval support is available as the objective is too far inland. Scheduled air support is limited to two attack only as per the rulebook, as most air support is protecting the supply routes and attacking the Italian mainland. 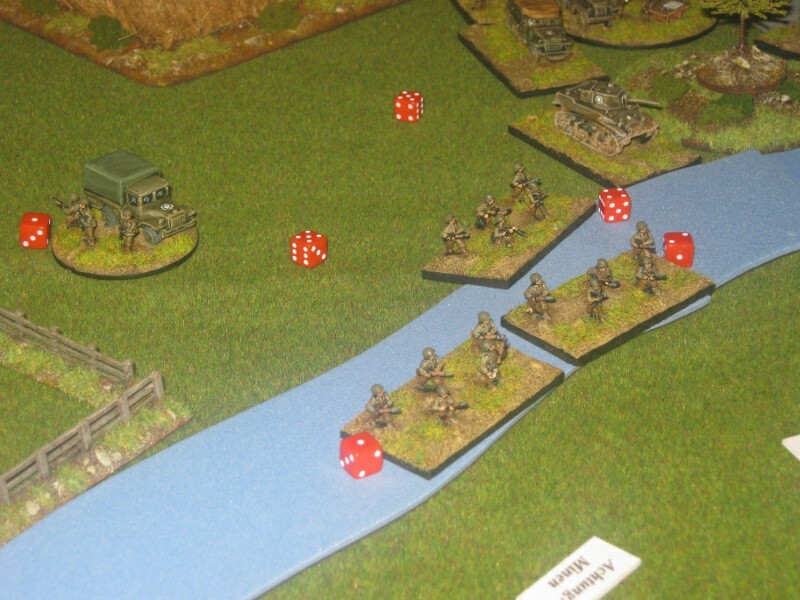 Any rivers are fordable at any point but troops count the edges of the river as linear terrain. The Italians, remanents the 28th Infantry Division 'Aosta', set up on the right hand side of the picture, in and around San Serotonin, well dug-in behind minefields and barbed wire. A battalion of the 171st CCNN Legion was on the right hand flank, with a battalion of the 5th Infantry Regiment on the left. Elements of Battlegroup 'A' in the form of L3/35 tankettes and Semovente 47/32 formed a mobile reserve as well as supporting the CCNN Legion. 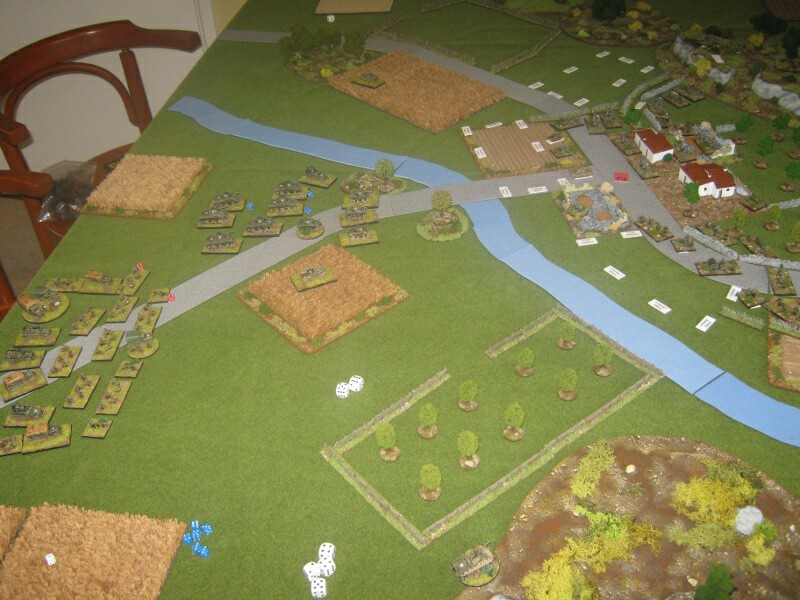 The Americans formed up on the left in a neat formation, ready to exploit gaps on either flank. A view of San Serotonin. 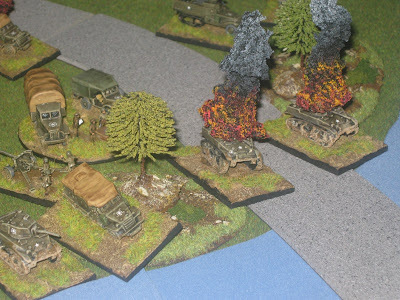 The Americans got off to a bad start, with an HQ blundering leaving the CO at -2 to his CV for this turn and the next. 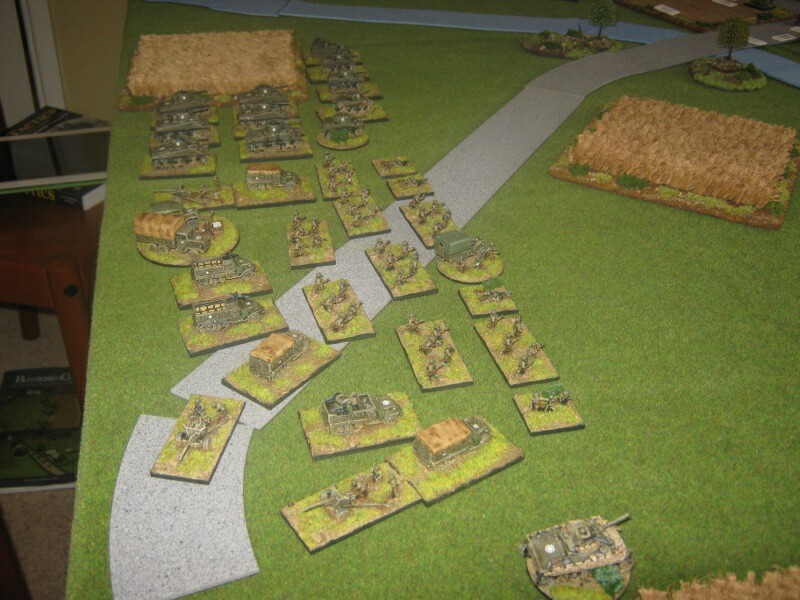 As a result, only the armour got moving on the American left flank. For the Italians, mortar fire killed and MG unit and supressed two infantry stands. A good start. The American armour on the move. 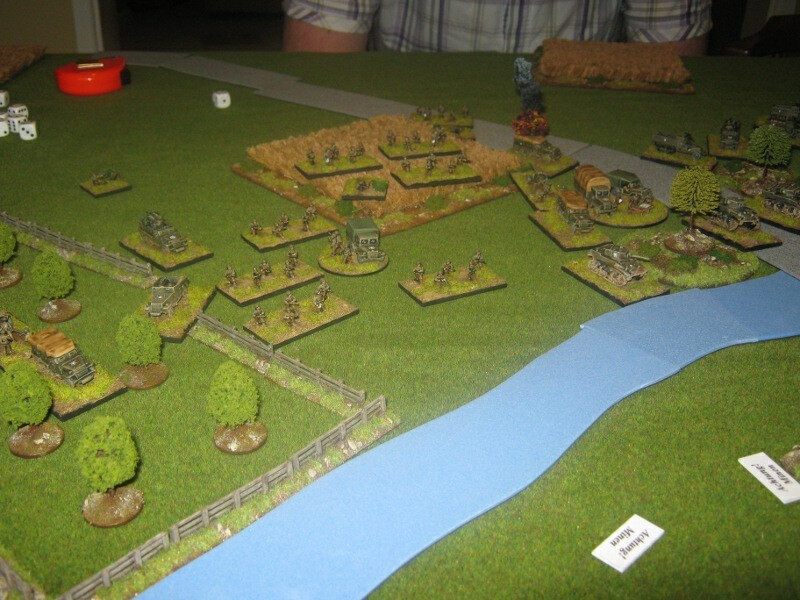 Amour moves on the left flank. "That's a lot of tanks!" 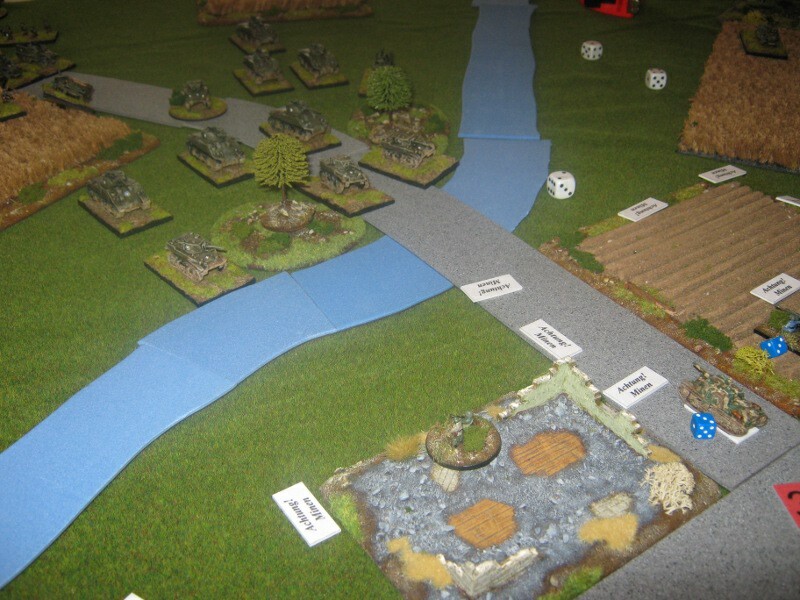 The American infantry and armour continue to advance, albeit slowly. Meanwhile, the Italian FAO, is having no luck as a blunder calls down fire upon his artillery units, which fortunately survive unscathed. The Italian commanders are still finishing off their lunches as no orders are issued. 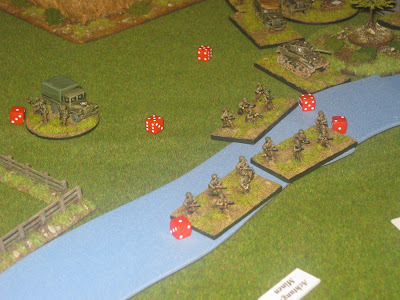 Communication difficulties continue to dog the Americans as some of the armour fails to cross the river and the infantry are in no-mans-land. The Italian artillery wakes up and the FAO calls in a nice concentration of fire on the American infantry in the open, causing supression and destroying a towed AT gun. 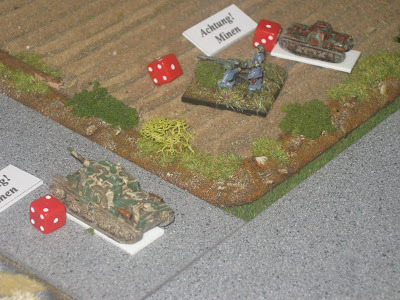 American armour threaten the Italian right flank. The effects of artillery fire. The Americans comms problems appear to have been sorted as things get moving on both flanks. 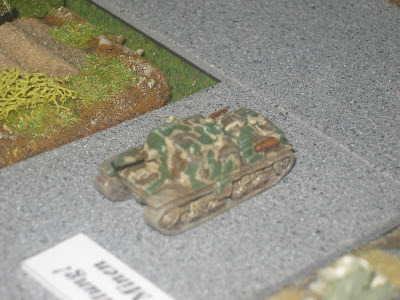 However, the Sherman and Stuart tanks, despite pouring lots of fire into the CCNN Legion, fail to achieve anything. The Italian FAO is having a bit of an up and down day. Once again he blunders, this time calling down fire on his own troops, the poor old CCNN Legion who have already been suffering at the hands of the American tanks. The American armour threatens the Italian right flank. 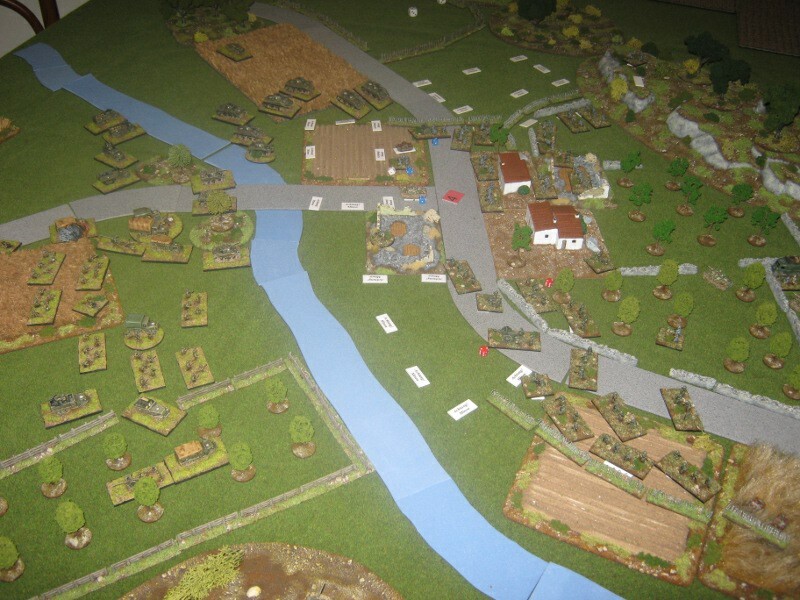 Stuarts and AT guns set up to control bridge. The effects of the FAO's blunder. Initiative fire by the American tanks (31 die in all) only supresses one infantry gun. 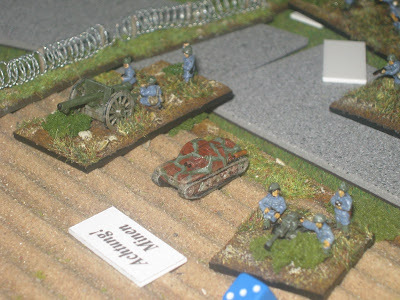 The American FAO calls down artillery fire that suppresses a lot of the Italian left flank. The infantry reach the river but the tanks fail their order. Maybe they are too busy re-stocking on ammo. 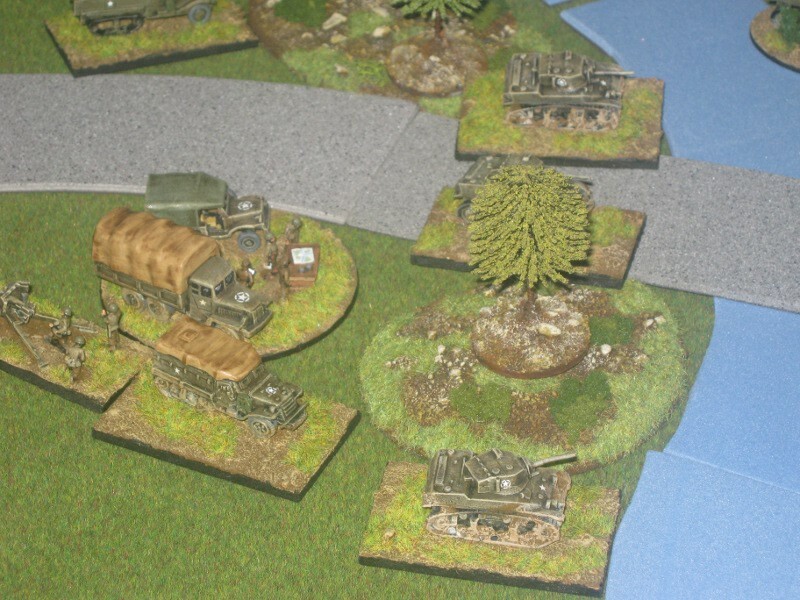 Initiative fire from the Semovente and ATG on the right flank brews up a Stuart. 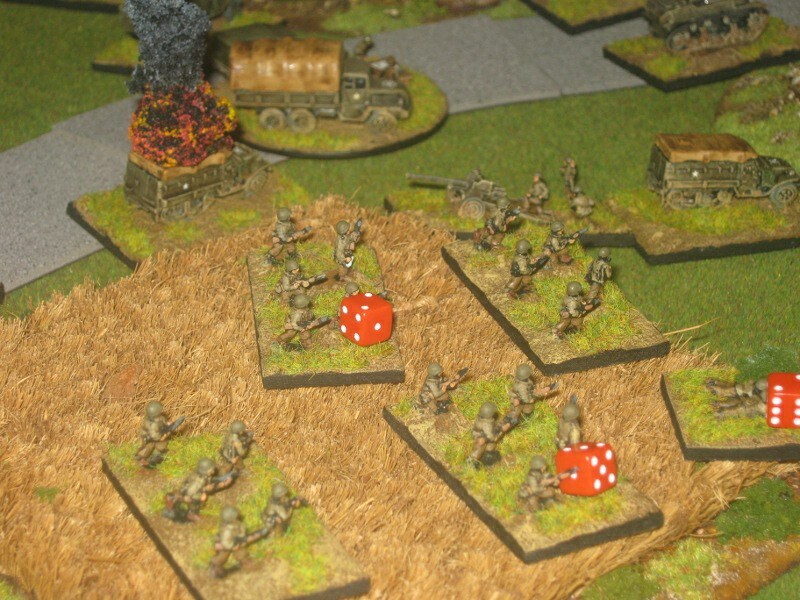 The FAO finally gets his act together, calling down fire on the infantry, killing two stands and an MG unit, supressing the others as well as the HQ unit. Mortar fire accounted for another infantry unit dead. The results of the American artillery. The results of the Italian artillery. 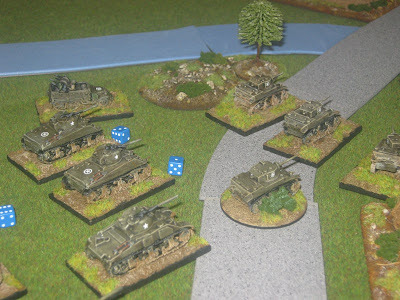 With the American right flank effectively suppressed, only the tanks could do anything. Without any support, they could only fire at the dug-in CCNN Legion. Once again the IG survives a large number of die rolled against it. The Italian FAO is now playing a bit of a blinder. Not caring for his own safety, he once agains calls in a concentration of fire right in front of him, but survives by sheltering in a building. 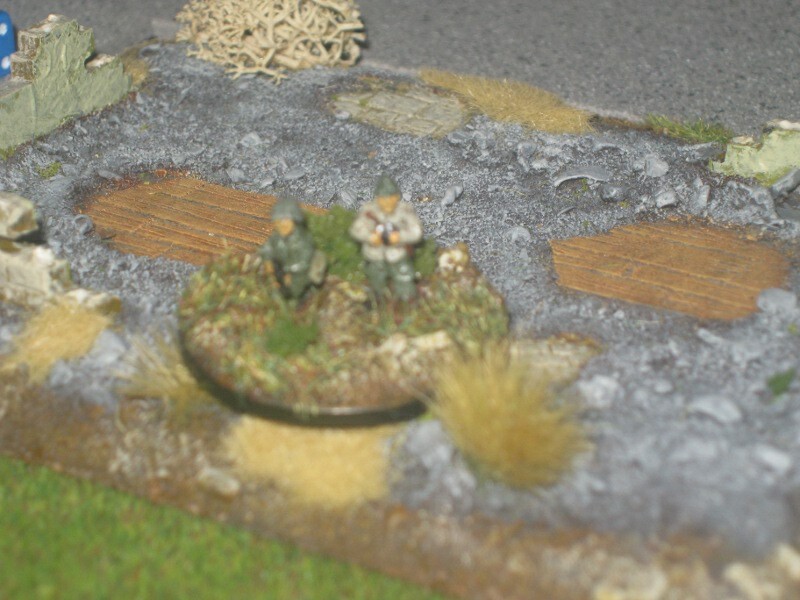 Once again, the remaining American infantry take cover and are suppressed. With little American infantry left, the chances of victory were remote. However, it's not over until the fat lady sings. Attempting to salvage some honour, the Sherman tanks finally destroy the CCNN Legions infantry gun. True to form, they died with their gun. 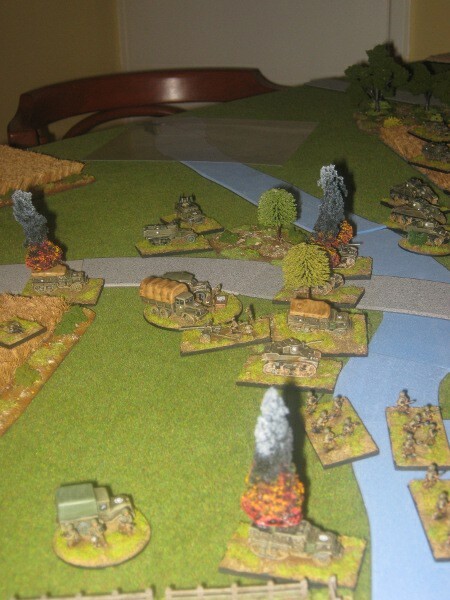 The Italian FAO, now with nochalant ease, called in more artillery, destroying a Stuart and infantry unit. 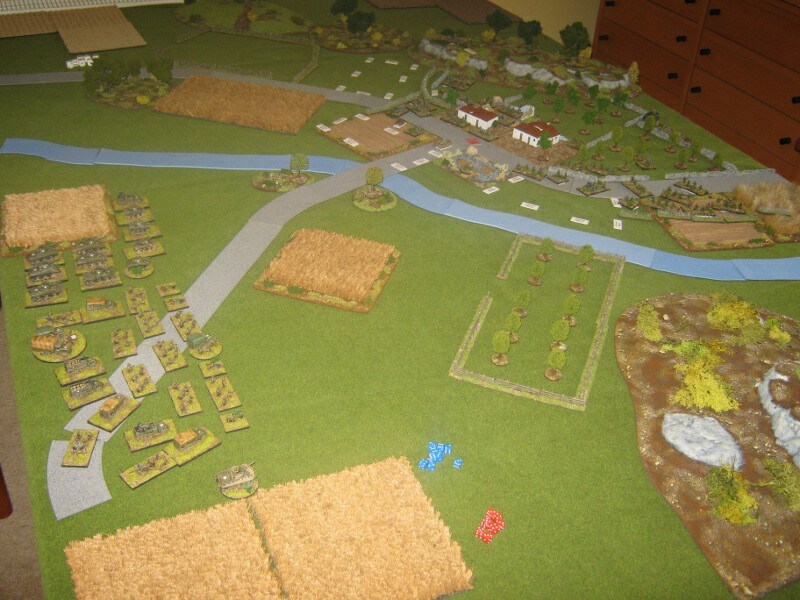 At the end of Turn 7, the Americans had reached their breakpoint of 18. With no prospect of an American victory, we called it a day. Even though it was a somewhat one-sided battle in the end, it was still fun. 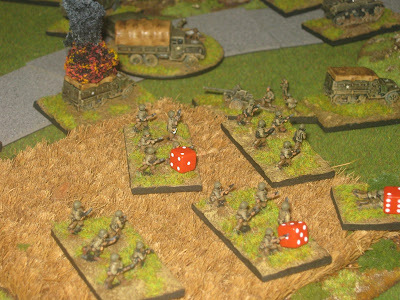 We used the optional rule of auto-suppression for artillery. 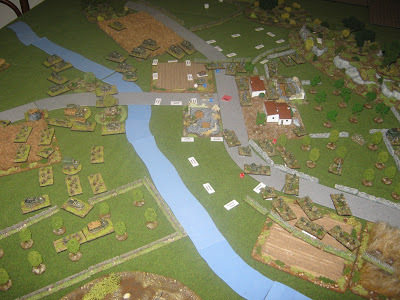 This felt completely right and nicely simulated the effect of keeping troops heads down, even when in trenches. It was a game of quite a few blunders, but no double 1s which is most unusual. Even with the aid of Recce units boosting the CVs by 1 a lot of the time, the American just couldn't get going at critical points, even when rolling on 9s. The Italian FAO played a blinder despite a somewhat shaky start. With a CV of 6, we were both amazed at how often he made his rolls, especially when the American were only one deviation die roll away. 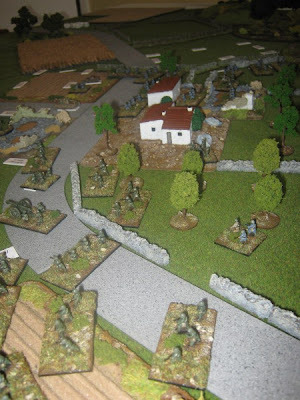 The American blunder at the start threw Christian off his initial plan of attacking the weaker Italian left flank. The move to divide his forces, we both agreed, may have cost him the game. 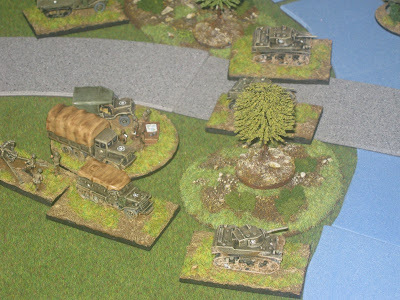 The dug-in IG, AT gun and Semovente on the right flank were able to weather everything that the Americans could throw at them. They effectively nullified any threat to this flank. The Italian FAO, taken by a drunk propoganda photographer. The IG took over 60 shots before succumbing! So, a nice evenings gaming (aided and abbetted by my sons Daleks at one point) with Christian and we are going to have a re-match at a future date to see if the Americans can gain their revenge. Great pics and report Steve. Cheers for a fun evening.